Oncology immunotherapy has gained significant advances in recent years and benefits cancer patients with superior efficacy and superior clinical responses. Currently over ten immune checkpoint antibodies targeting CTLA-4 and PD-1/PD-L1 have received regulatory approval worldwide and over thousands are under active clinical trials. However, compared to the rapid advance of Monoclonal Antibody (mAb), studies on immunotherapeutic small molecules have far lagged behind. Small molecule immunotherapy not only can target immunosuppressive mechanisms similar to mAbs, but also can stimulate intracellular pathways downstream of checkpoint proteins in innate or adaptive immune cells that mAbs are unable to access. Therefore, small molecule immunotherapy can provide an alternative treatment modality either alone or complementary to or synergistic with extracellular checkpoint mAbs to address low clinical response and drug resistance. Fortunately, remarkable progress has achieved recently in the pursuit of small molecule immunotherapy. This review intends to provide a timely highlight on those clinically investigated small molecules targeting PD-1/PD-L1, IDO1, and STING. The most advanced IDO1 inhibitor epacadostat have been aggressively progressed into multiple clinical testings. 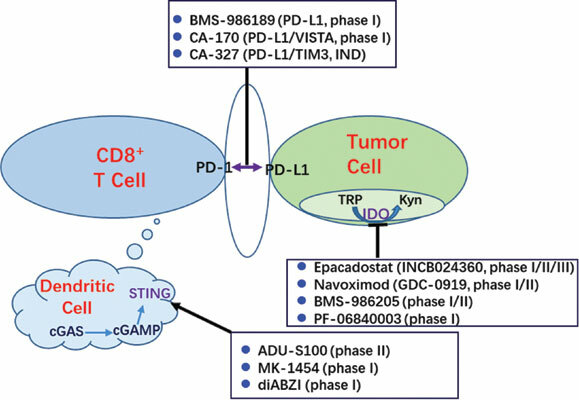 Small molecule PD-1/PD-L1 inhibitors and STING activators are still in a premature state and their decisive application needs to wait for the ongoing clinical outcomes. Since no small molecule immunotherapy has been approved yet, the future research should continue to focus on discovery of novel small molecules with distinct chemo-types and higher potency, identification of biomarkers to precisely stratify patients, as well as validation of many other immune-therapeutic targets, such as LAG3, KIRs, TIM-3, VISTA, B7-H3, and TIGIT. Abstract:Oncology immunotherapy has gained significant advances in recent years and benefits cancer patients with superior efficacy and superior clinical responses. Currently over ten immune checkpoint antibodies targeting CTLA-4 and PD-1/PD-L1 have received regulatory approval worldwide and over thousands are under active clinical trials. However, compared to the rapid advance of Monoclonal Antibody (mAb), studies on immunotherapeutic small molecules have far lagged behind. Small molecule immunotherapy not only can target immunosuppressive mechanisms similar to mAbs, but also can stimulate intracellular pathways downstream of checkpoint proteins in innate or adaptive immune cells that mAbs are unable to access. Therefore, small molecule immunotherapy can provide an alternative treatment modality either alone or complementary to or synergistic with extracellular checkpoint mAbs to address low clinical response and drug resistance. Fortunately, remarkable progress has achieved recently in the pursuit of small molecule immunotherapy. This review intends to provide a timely highlight on those clinically investigated small molecules targeting PD-1/PD-L1, IDO1, and STING. The most advanced IDO1 inhibitor epacadostat have been aggressively progressed into multiple clinical testings. Small molecule PD-1/PD-L1 inhibitors and STING activators are still in a premature state and their decisive application needs to wait for the ongoing clinical outcomes. Since no small molecule immunotherapy has been approved yet, the future research should continue to focus on discovery of novel small molecules with distinct chemo-types and higher potency, identification of biomarkers to precisely stratify patients, as well as validation of many other immune-therapeutic targets, such as LAG3, KIRs, TIM-3, VISTA, B7-H3, and TIGIT.